Do you recall the times when you were young and loved ripping up the wrapper to get to the present? I definitely do. That's why I think that wrapping a gift is pretty essential. Children love guessing what's inside. Although the adults may not admit it, but it's true, they love that sense of guessing too. As we grow older, we tell ourselves that we don't like surprises. But in actual fact, it's the unknown of weather or not the person got you a gift you like. Having to deal with the disappointment of receiving something you don't like and sparing the gifter's feelings, can get all tiresome. So in short we say we don't like surprises. It was easier when we were kids, we got excited and loved everything that was new. That changed as we grew. The fact still remains though that you do get a rush of excitement when you see a gift that is wrapped. I love wrapping gifts. My hubby used to ask me why I bother so much know the kids are going to rip it off. It's just the knowing that I presented my best and although its just a minute or two, their excitement of the unknown is there until the wrapper comes off. Should the wrapper at least build up to that excitement too. Here a picture of a photo frame gift wrapped. It would be simple gift should I have stopped at the wrapper. But notice that little embellishments make it just a tad more enchanting. 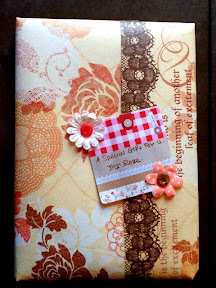 By adding the fabric flowers, little buttons and patterned post-it, I have added texture to the otherwise simple wrapper. Another way to add texture to you gift wrapping is to add ribbons. A big bow, really enhances the wrapping. 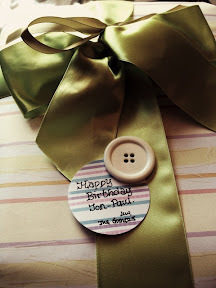 Here, I have used two sizes of ribbons and two shades of green that compliment each other. Also, a self made gift card using a circle punch and a designed paper, to write on. And lastly, to add a final touch, I placed a big white button to tie together the card and the satin ribbon. I hope in future, when you receive a gift, you would appreciate the wrapping and enjoy the gift. Also, give it a try to make your wrapping look more enchanting by, simply adding some embellishments you have in the house. "when your gifts look as good as you"